Trump suggested that among the deals which would be at stake were investment in military equipment made by Saudi Arabia, which he claimed was part of a $400 billion investment by Saudi in the U.S. In the past, the president has claimed a $110 billion investment from the Saudis in defense equipment that would disappear if the U.S. sanctioned the nation's military sector. 'If you think I'm going to let Russia have that money or those things, if you think I'm going to let China make the military equipment — hey, China and Russia would love to make a hundred billion dollars worth of military equipment from Saudi Arabia. We have the contracts. They wanted those contracts,' he said on Tuesday. He also said that he believed Saudis would send up global oil prices, which he took personal credit for keeping low. If he were to act against the kingdom, Trump suggested there would be a global economic meltdown. Trump also denied that he had any personal financial interest in Saudi Arabia, saying: 'Well I have nothing to do with Saudi — just so you understand. He said the presidency has cost him more than he's profited, although he refused to say how much. His claims came in response to the critical reception that a lengthy written statement defending Saudi Arabia had received. Before he pardoned two Thanksgiving turkeys, Trump indicated that he wasn't convinced by the CIA's version of the events leading to Khashoggi's death. 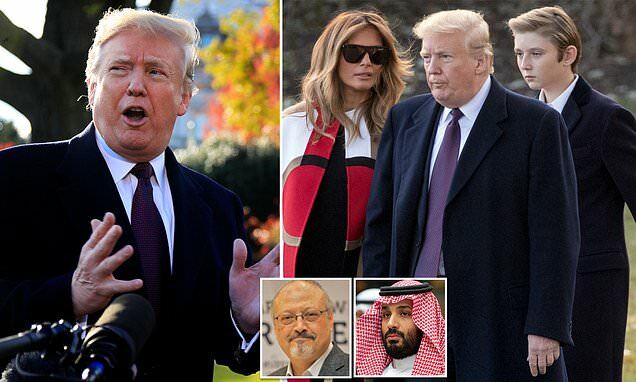 'Our intelligence agencies continue to assess all information, but it could very well be that the Crown Prince had knowledge of this tragic event – maybe he did and maybe he didn't!' the president said.